everything LEB: Kevin Sharkey, You're My Hero! Kevin Sharkey, You're My Hero! Just to update all those who are not in the know- Kevin Sharkey is SVP and Executive Editorial Director, Decorating, and Executive Creative Director, Merchandising for Martha Stewart. In other words, one fabulously creative and talented person. 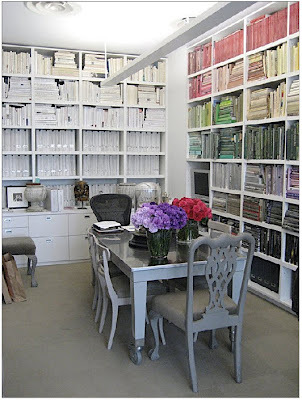 Just look at his office at Martha- I seriously have no words. Just insane jealously and admiration for a person who gets to work in this space every single day. They are the SAME Ikea boxes I have...and they put mine to s.h.a.m.e. 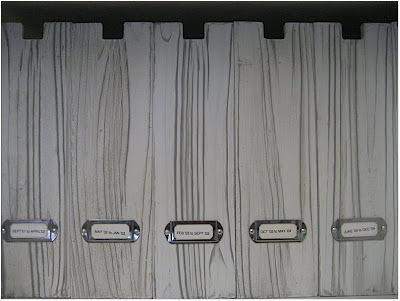 He had his painted faux bois and has the perfect little label holders on the front...swoon! pens and pencils all ready to grab in beautiful silver cups. So my blog friends, that is why Mr. Kevin Sharkey is my hero. He just started his very own blog and I think I just became his #1 fan- in a total non-stalkerish, only high admiration for such a talented designer kind of #1 fan. PS- Kevin, are you looking for an assistant? Have your people contact my people me (who am I kidding, I don't have people). That bookcase is the most swoon worthy bookcase I have ever seen! I just totally had a "hello Lover" moment. 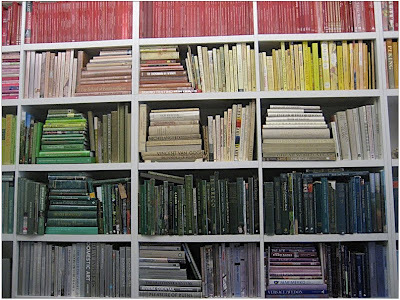 The color organzined bookcase is fantastic. I wouldn't want to go home if my office looked like that. Haha, i LOVE it! 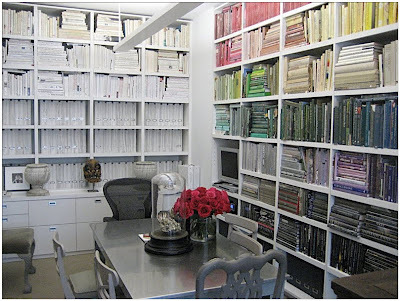 did you see my post yesterday about Martha's office? Maybe they will hire us both! simply gorgeous... such great detail. Yeah, forget that whole PC stuff - I admire in a TOTALLY stalkerish kinda way! Seriously..insane! P.S. - Do you think perhaps he's a tad OCD? What with all that organized perfection? Probs not...just incredibly creative and...PRECISE! Love it!! Heading over there now! Alison, I think its more pure genius rather than OCD- but whatever it is, I want in and I want to work for him. I still cant get over how amazing that space is! Amazing! I swear anything from the Martha Stewart team is just golden. Linds I would be proud to be your people so just have Kevin's people call me. Now I need an office redo! wow, I love his desk! 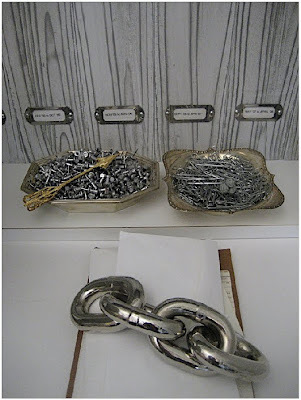 It looks like he used antique ashtrays for his paperclips and whatnot... that is super swank! 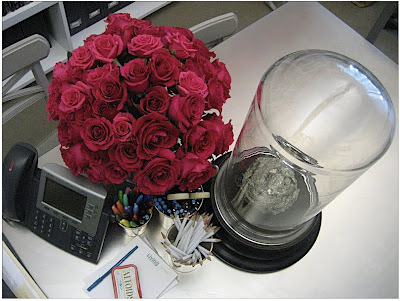 and really, shouldn't we all have gorgeous flowers on our desks everyday? can't wait to check out his blog! You are too funny! I love this office. I wish I knew where to get that cool roller, stainless steel table - is that MS? Love it. Yes, def a 'hello lover' moment! ha. I don't even know what else to say. Those bookcases are unbelievable. SERIOUSLY. 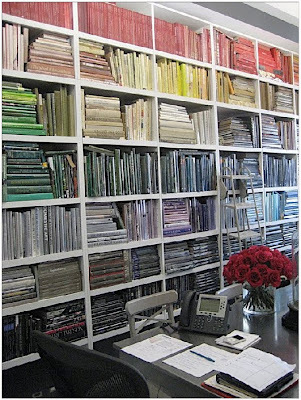 I think that guy is either totally OCD crazy or has a ton of assistants that rock his detailed world. It is truly gorgeous but I can't even fathom the thought of being t.h.a.t. o.r.g.a.n.i.z.e.d. I want those gorgeous flowers on this desk!! Um, okay, now I feel even worse than I already to about my work space. I want to trade mine for his. I'm off to stalk - I mean, check out - his blog now. Still drooling over this one...love, love, love that office! I want to move in!!! Love it! OK...so I actually said outloud "hello lover" when I first saw this pic. And then I proceeded to read the post! WOW. How much do I love the chain link paper weight?! Among everything else in here!!! It made me feel special to see that this brill guy keeps his pens/pencils and paperclips the EXACT same way I have mine!! I'm geeking out right now! Ha! Great post, Miss L.
oh my goodness I have a small crush on him. posted about his office a few months ago, but WOW, these pics are crazy. thanks for the heads up about his blog!